The LaLiga matchday 17 showdown between Real Madrid and Barcelona will be available to watch on beIN SPORTS, beIN SPORTS CONNECT and beIN SPORTS en Español. 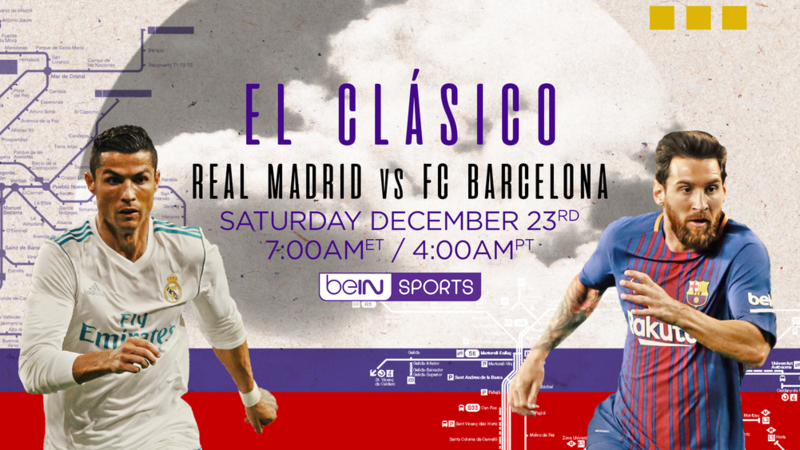 Soccer fans will be treated to an early gift this holiday season in the form of the 237th edition of the world's favorite grudge-match: El Clasico! Real Madrid, fresh off the back of retaining their Club World Cup title, return to LaLiga action with a mouth-watering clash against bitter rivals Barcelona. Cristiano and co. will be looking to impress the always-expectant Santiago Bernabeu faithful by narrowing the 11-point gap that separates them from the Catalan giants, who sit at the summit of the table. Being the home of LaLiga, beIN SPORTS is the only place you can watch El Clasico. The coverage begins early Saturday December 23rd with the Express Preview show at 6 AM ET / 3 AM PT before the main event kicks off at 7 AM ET / 4 AM PT on beIN SPORTS and beIN SPORTS en Español. And to mark the occasion, we will be offering viewers a Second Screen Experience on our beIN SPORTS CONNECT channels. See below for more details. Next Why Is beIN SPORTS No Longer on Xfinity?